C.E.T. 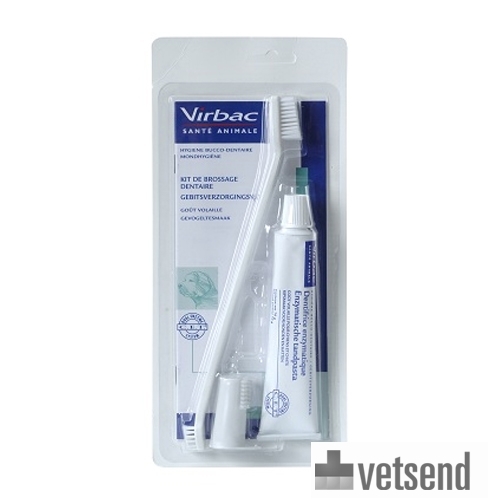 Dental Care Kit for dogs and cats with toothbrush, finger brush and chicken-flavoured toothpaste. 80% of dogs and cats over the age of 3 experience dental problems. More often than not, owners are well aware of the fact that dental problems are common, but they still take too little action when it comes to actually preventing these problems. 96% of veterinarians recommend brushing teeth: only a small percentage of owners actually brush their pet's teeth. A specially shaped toothbrush, which is double-sided for small and large dogs. The toothbrush is adapted to the shape of canine teeth. Using an ordinary toothbrush is not only inconvenient, but may also damage the cheek or gums. Finger brush, easy for the learning phase of brushing teeth. Have you used C.E.T. Dental Care Kit before? Let us know what you think about this product.